Then the shaman said again, “Every living fish, every living fish” and his people had to repeat what he said…Then he said, “Go a little farther to the open sea, and you will find them.”… Then he said, “Pull up your fishing lines!” They hauled up their lines, and all the hooks were full of halibut. The traditional rig for halibut fishing consisted of a stone weight; a long line of twisted red-cedar bark or dried kelp; a pair of barbed wooden hooks made from crooks of red or yellow cedar or else a single two-piece hook; and a wooden surface float shaped like a bird. 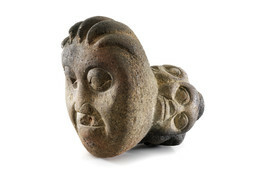 This unusual Nisga’a sinker is shaped like a human head clutched in the claws of a bear, with four smaller faces encircling the line hole. It might have been made for shamanic ritual, its images representing helping spirits (naxnox) that brought fish to the people. The carving was found in a deserted house by the Nass River.